The next few days I will do some blogging on the International Documentary Festival Amsterdam with the focus on those events in which new media practices are visible in traditional forms of filmmaking or are influencing form, context, and content of the documentary genre. The relationship between film and new media is not an uncomplicated one. Filmmakers, generally speaking, love the cinematic apparatus. It is immersive, it focuses attention, gives the director the power to structure his narrative and he can lead the viewer step by step through his conception of the world. On the other hand, new media practices offer not only cheap and workable (post) production tools but merely create a totally new perspective on storytelling. They change the relation between the filmmaker and audience, screening possibilities, and international cooperations. At the Idfa these alternative ways of storytelling can be found in the Doc Lab program. This program is a mixture of online documentaries, installations, talks, presentations, and live screenings. Doc Lab presents new media as a new sort of genre and covers an interesting range of related issues: it is related to the question what makes an interesting story, how to screen it, how the platform is influencing the perception, and questions the search for a redefinition of the role of the spectator/user. Generally speaking the projects presented at Doc Lab do not follow the traditional rules of narration, and do not stay within one singular medium. This creates room for interesting experiments within a multidisciplinary domain where film, representation, audience response and narration interact and cross boundaries. Friday evening in the Zuiderkerk two projects were presented which can be considerd opposites as well as related at the same time. The first one was the istallation T_Visionarium by Jeffrey Shaw. T_Visionarium is a highly technological archival interface piece which is circumventing the traditional search engine politics as we became familiar with in this age of googlization. The second presentation was by Perry Bard, a New York artist who initiated a remake of the classic movie Man with a movie camera by Dziga Vertov. Jeffrew Shaw stated that his presentation should be seen in the context of data visualization, navigation, and reformulation. 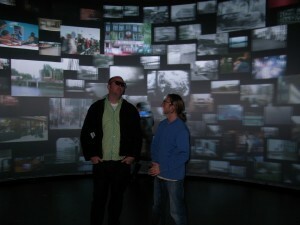 In a circular CAVE-like 3D projection the installation shows clips from the archive of Beeld en Geluid.The art installation is developed by the iCinema Centre for Interactive Cinema Research at The University of New South Wales in co-operation with ZKM Center for Art and Media, Karlsruhe. 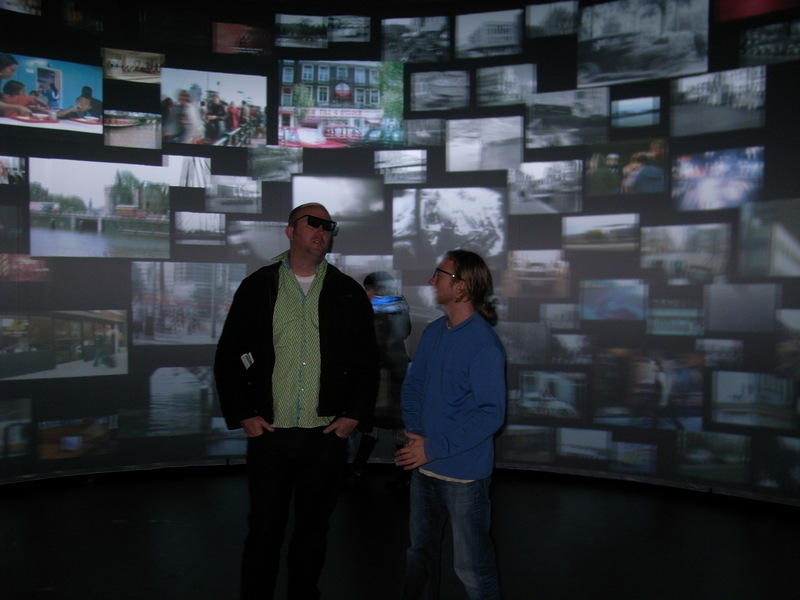 In contrast to the conventional mode of viewing where spectators passively watch a singular linear story unfold on a flat screen, T_Visionarium functions as some sort of a search engine that allows viewers to explore and edit a multitude of stories, in 3 dimensions, on a 360-degree fully surrounding screen. The screen measures four meters high and ten meters in diameter while twelve digital projectors create a high-resolution stereoscopic 3D image that can be watched with three dimensional glasses. The audio is spatially enhanced via a 24-channel surround sound system. Via a remote control the spectator can choose the tags or key-words (like human, spatial, color, content, composition) by which he or she wants to start the search. This way clips are selected and related clips appear in the immediate vicinity. By pointing the viewer can choose, enlarge and play clips. In his presentation Shaw showed some of his other related projects like There is Still Time… Brother (2007) by the Wooster Group. This piece, and interactive installation specially made for Shaw’s Panorama Screen, enables the visitors to individually explore a complex filmic scenario. The work exemplifies how Shaw is not the only one who develops content for his installations, camera’s, and projection screens but how he also works with other artists who make us of the of the by him developed technologies. One could say that Shaw’s work is twofold. On the one hand he is developing new technological concepts and on the other hand he develops content for these new technologies. Where Shaw undertook the effort to make tangible a huge database archive to a few spectators, Perry Bard is doing somehow the opposite. She tries to turn a singular historic event, the film Man With a Movie Camera (1929) by Dziga Vertov , into a communal experience. 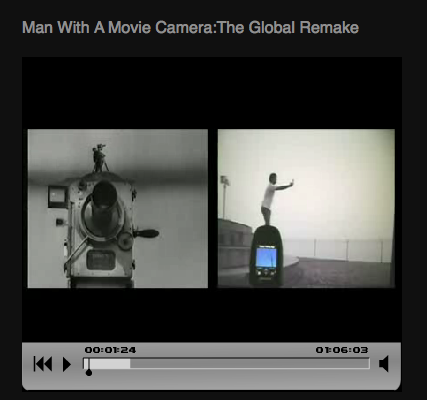 Man With a Movie Camera: The Global Remake is a participatory video shot by people around the world. Anyone is invited to record images and to interpret the original script of Vertov’s Man With A Movie Camera and upload them to the site. The site http://dziga.perrybard.net/ archives, sequences and streams the submissions as a film and the contributions become part of a worldwide montage that, to speak in Vertov’s terms, “decodes life as it is”. Bard, who has worked previously on video’s and installations in the public space, gives with this first online project a new dimension to the so called database cinema as being conceptualized by Lev Manovich in Database as a Symbolic Form (1998). For Manovich, Vertov was an early database filmmaker and he considers Man with a Movie Camera as the most important example of database imagination in modern media art. In her project, Bard tries to invoke a new database, based on Vertov’a original one, which consists of new interpretations of Vertov’s imagery. Shaw is presenting the archive, a world of images, to the spectator, Bard is asking her audience to give their images to her. She collects the clips from all over the world to fit them in Vertov’s structure. This collaborative remake does seem to give us new insights. Insights about how we treat the camera, how we are able to adapt to a database concept, and how we can enjoy studying these comparisons. The visual and conceptual relations and interpretations that have been uploaded so far are fascinating to watch. Why? Maybe because the translations of the Vertov images give us an interesting insight in, and reflexion on, the development of our world and our behavior within the changing landscape of technologies.